Pig on Storm Proposal - Apache Pig - Apache Software Foundation for your Wiki! Topology - A topology is a graph of computation. Each node in a topology contains processing logic, and links between nodes indicate how data should be passed around between nodes. 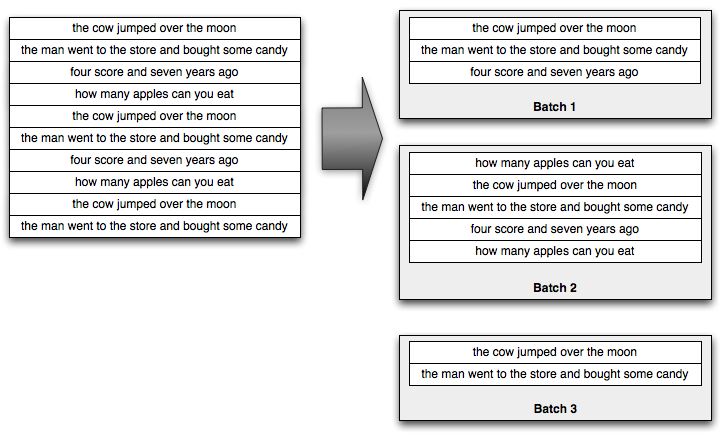 Tuple - Storm uses tuples as its data model. A tuple is a named list of values (same as Pig), and a field in a tuple can be an object of any type. Stream - The core abstraction in Storm is the "stream". A stream is an unbounded sequence of tuples. Storm provides the primitives for transforming a stream into a new stream in a distributed and reliable way. Spout - A spout is a source of streams in a topology. Generally spouts will read tuples from an external source and emit them into the topology. Bolt - All processing in topologies is done in bolts. Bolts can do anything from filtering, functions, aggregations, joins, talking to databases, and more. Stream Grouping - Part of defining a topology is specifying for each bolt which streams it should receive as input. 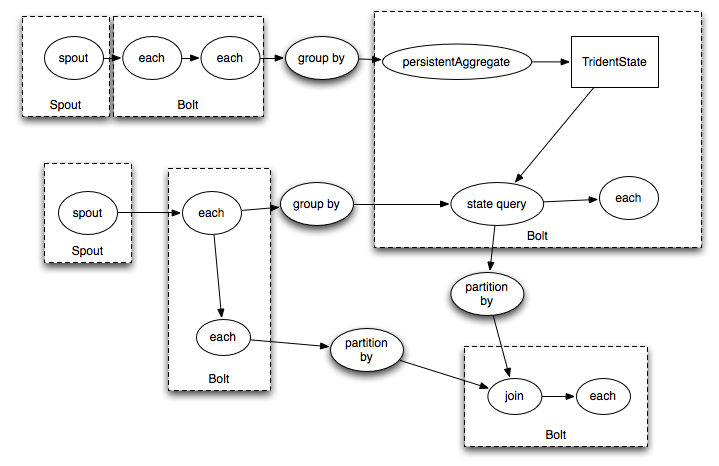 A stream grouping defines how that stream should be partitioned among the bolt's tasks. The following Pig operators have clear semantics in Storm and can be easily implemented. Since the semantics are decided, these should have little impact on overall functionality. FILTER - Filter has very clear semantics in Storm as Filter's operate on a single Tuple (as Bolt's do) and choose to emit the Tuple or swallow the Tuple. FOREACH - Foreach in Pig operates over a single Tuple from a Relation. This is analogous to a Bolt processing a single Tuple as they are streamed to it. SPLIT - Split has clear semantics in Storm since you can split a stream of tuples into multiple streams based on any number of criteria. UNION - Union can be easily implemented by simply merging the streams into a single stream. SAMPLE - Since sample decides to emit a Tuple randomly based on a probability, sample also has clear semantics in Storm. DISTINCT - Distinct can be easily implemented by ensuring that Tuples with the same content are grouped on to the same Bolt Task and emit only distinct Tuples. (Will be stateful). LIMIT - Limit has clear semantics because you can stop a stream after emitting the given number of tuples. (Will be stateful). The following Pig operators have unclear semantics and Storm. The type of operation you need will vary per application. For example, for some applications a join means, join all tuples for two streams over a finite window of time, whereas other applications expect exactly one tuple for each side of the join for each join field. Other applications may do the join completely differently. Deciding the semantics of these operators is critical to the implementation. JOIN (inner/outer) - A streaming join combines two or more data streams together based on some common field. Whereas a normal database join has finite input and clear semantics for a join, a streaming join has infinite input and unclear semantics for what a join should be. GROUP - Grouping relations has semi-clear semantics. A type of Stream Grouping called FieldsGrouping can be used to ensure that Tuples with the same group key will be sent to the same task. However, in Pig a group operator allows you to construct a row around the set of tuples that have the group key and allow you to work with the entire row as a single unit. In Storm, for a group key, you get an unbounded stream of Tuples. CROSS - Computing the cross product of unbounded streams doesn't make sense. ORDER BY - Sorting doesn't make sense on an unbounded stream of tuples. Order by is generally used in conjunction with limit to implement a top-n computation. RANK - Similar to order by and limit. The following are Pig operators that are not relational. Deciding the semantics of the following should have little impact on overall functionality. STREAM - Stream has clear semantics in Storm. Storm has out-of-the-box support for sending Tuples to external processes via the use of ShellBolt. MAPREDUCE - MapReduce has unclear semantics as to how the output of a MapReduce job will integrate into a streaming workflow. LOAD - Load has unclear semantics in Storm, since Storm doesn't "load" data. Spouts are sources for streams of Tuples. STORE - Store also has unclear semantics in Storm as storm doesn't have to output any data, but it can do so. Sink Bolt's usually write data into a database or some other persistant storage. Trident is a high-level abstraction for doing realtime computing on top of Storm. It allows you to seamlessly intermix high throughput (millions of messages per second), stateful stream processing with low latency distributed querying. For pig users, the concepts of Trident will be very familiar – Trident has joins, aggregations, grouping, functions, and filters. In addition to these, Trident adds primitives for doing stateful, incremental processing on top of any database or persistence store. Trident has consistent, exactly-once semantics, so it is easy to reason about Trident topologies. Generally the size of those small batches will be on the order of thousands or millions of tuples, depending on your incoming throughput. Trident provides a fully fledged batch processing API to process those small batches. The API is very similar to what you see in high level abstractions for Hadoop like Pig or Cascading: you can do group by's, joins, aggregations, run functions, run filters, and so on. Of course, processing each small batch in isolation isn't that interesting, so Trident provides functions for doing aggregations across batches and persistently storing those aggregations – whether in memory, in Memcached, in Cassandra, or some other store. Finally, Trident has first-class functions for querying sources of realtime state. That state could be updated by Trident (like in this example), or it could be an independent source of state. A key problem to solve with realtime computation is how to manage state so that updates are idempotent in the face of failures and retries. It's impossible to eliminate failures, so when a node dies or something else goes wrong, batches need to be retried. The question is – how do you do state updates (whether external databases or state internal to the topology) so that it's like each message was only processed only once? This is a tricky problem, and can be illustrated with the following example. Suppose that you're doing a count aggregation of your stream and want to store the running count in a database. If you store only the count in the database and it's time to apply a state update for a batch, there's no way to know if you applied that state update before. The batch could have been attempted before, succeeded in updating the database, and then failed at a later step. Or the batch could have been attempted before and failed to update the database. You just don't know. Each batch is given a unique id called the "transaction id". If a batch is retried it will have the exact same transaction id. A physical plan can most likely be directly translated into a Storm topology. I don't think a different physical plan would be needed but I'm not sure. This seems like the simplest solution since we can connect to Trident at the language layer and have Trident handle the planning. Yes. Pig currently only has support for LoadFunc and StoreFunc and these are heavily integrated into the hadoop Input/OutputFormat concepts. There will also need to be additional concepts that Pig is missing right now, mainly a DataSource (or something like that) concept for identifying stream's of data. The parallelism concept in Pig will probably have to be extended/modified to allow users to be able to control parallelism for the Storm topologies. Any approach to a streaming extension to Pig should be done with care to allow for other streaming implementations (such as S4). S4 - S4 is a general-purpose, distributed, scalable, fault-tolerant, pluggable platform for processing continuous unbounded streams of data. HStreaming - HStreaming is a real-time data analytics platform to analyze, process, store and archive streaming data on Hadoop. Summingbird - Summingbird is a platform for streaming map/reduce used at Twitter to build aggregations in real-time or on hadoop. Spark - Spark is an open source cluster computing system that aims to make data analytics fast — both fast to run and fast to write. Jubatus - Jubatus is a distributed processing framework and streaming machine learning library. Much of the information about Storm and Trident has been copied (shamelessly) from the original documentation that can be found at https://github.com/nathanmarz/storm/wiki. I'd like to thank the Storm team for providing great documentation! Pig on Trident would be a cool and welcome project. Join and groupBy have very clear semantics there, as those concepts exist directly in Trident. The extensions needed to Pig are the concept of incremental, persistent state across batches (mirroring those concepts in Trident). Tap - Could be any number of logical things like 'source', 'tap', 'openstream', or somesuch. I like 'tap'. Persist - Things like 'sink', 'setsink', 'storestream', and 'persist' all work. I like 'persist'. UDFs - Trident must be able to run Pig udfs. I think (but haven't fully grokked yet the intricacies of the parser) that we know the context of a udf. That is, whether or not it's being run on grouped data and implements the appropriate algebraic or accumulator interfaces (which map to Trident aggregators quite well) or if it's running on ungrouped data and can simply be mapped to Trident's each(). Things that are weird - DataBag and FLATTEN - Any thoughts here on how to keep this clean with storm/trident? Off the top, could a DataBag secretly be a TridentCollector? LogicalPlan versus PhysicalPlan - Again, this will require more digging, but shouldn't the LogicalPlan be the thing the TridentCompiler (or whatever) receives to build the appropriate TridentTopology? I'll write back once I get a clearer image in my head of how pig actually creates the DAG. There should be a class called TridentLauncher that implements the mapreduceLayer Launcher. It will use the method 'launchPig()' to build a trident topology from a physical plan. I've already got this "working" with Pig's filter by just initializing an arbitrary spout here and converting the POFilter to an each() on a trident stream. The filter I defined in my pig script is then applied to the trident tuples emitted by the spout. I believe it should be possible to address all the PhysicalOperators in this way except POLoad and POStore. Maybe those as well, thinking on it still. Spout - Couldn't we just write a class that implements both the LoadFunc interface as well as the IBatchSpout interface? So long as Pig's LogicalPlanBuilder can validate the class as being a LoadFunc, we should be able to make the methods like 'getNext()' actually just no-op. I haven't tried this yet so maybe I'm just dreaming. All in all I forsee this working. I'll be committing some work in progress changes here shortly. Feedback would be excellent. Thanks for your great input. I have a couple of comments/feedback. I love the 'tap' keyword for 'tapping' into streams. I was also thinking of something along the lines of "listen to 'url' using SomeTridentSpout()" as an alternative. But the main point of this is that we need to using a different keyword than 'load' so as to have a distinction for bounded and unbounded. Persist doesn't make sense for a few reasons. The first is that you don't write TridentState objects or tell Trident to persist to a State object. 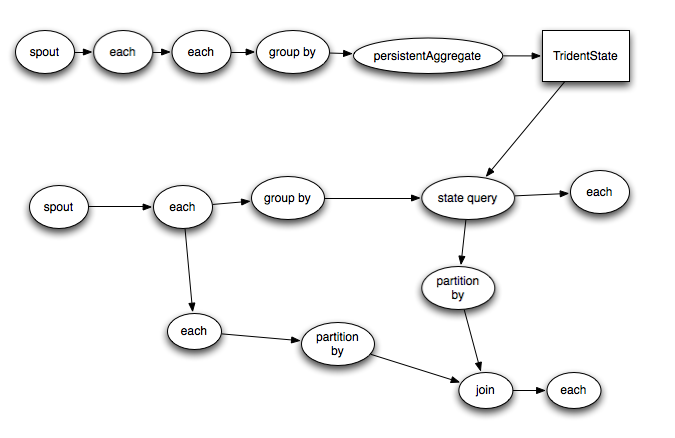 Whenever you have aggregations in your Topology, you automatically get a State. This state is backed by a storage layer which can be in-memory, hbase, cassandra, memcached, or some other custom implementation. Any bolt can do persistence (i.e. storage) but the State concept is a little different from storage. Trident needing to run Pig UDFs is something that I'm also thinking of, but with the above point about aggregations creating State's is something I'm not sure about yet. My initial plan is to hook up the LogicalPlan to the TridentTopologyBuilder and let Trident handle optimizing the topology. I'm not sure if I want to have classes implement both the LoadFunc and IBatchSpout interfaces. I'm aiming towards an abstraction layer that is independent of the execution engine. I think it would be a good idea to have a new interface (ITap or IStream? ), similar to LoadFunc, but for streams. The storm execution engine can then figure out how to translate the API calls. My goal is to eventually implement another real-time backend (maybe S4) to pig, so I'd rather not tie myself to the Storm implementation details. So we're leaning toward 'tap' then? In that case we'd need LOTap and, yes, an ITap interface sounds right. It's my understanding that not all aggregations create a storage layer backed state (at least not directly accessible). Only persistentAggregate (an abstraction on top of partitionPersist) does this. In either the persistentAggregate or partitionPersist case there's a state updater object that knows how to update a state backed by the storage layers you've mentioned. Maybe the right answer is a keyword called 'update' to update state? I don't have to run either persistentAggregate or partitionPersist to continue processing `stream` from there. I prefer the LogicalPlan instead of PhysicalPlan approach. I suggested the latter after looking at the current Spork implementation. I'll have to look at the 0.12 branch of Pig to see how things are different since, according to Dmitry (@squarecog) arbitrary executionengines are allowed now. If this feels right, can we open up a jira and start actually cracking at this?